Ampco Pumps Company has introduced a new line of pumps and accessories especially for the brewing and winemaking industries. Priced competitively and designed specifically for craft-scale operations, these useful tools bring convenience, reliability, and repeatability to your operations so you can focus on making the tastiest beverages! 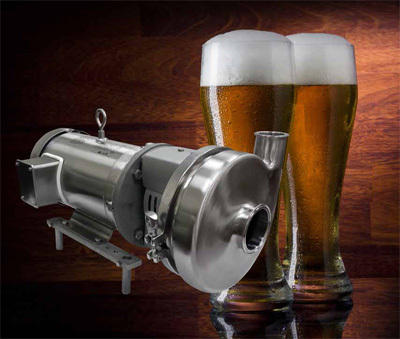 Ampco’s new CB+ Craft Brew Pump was developed specifically for the craft brewing industry, allowing brewmasters to focus on creating their next signature beer rather than deal with leaking pumps. The ROLEC DH line of hop induction systems is comprised of fully portable units that contain everything necessary for dry hop induction. The ROLEC DH utilizes Ampco’s SBI Shear Pump to simultaneously induce dry hop pellets directly into the stream of beer and recirculate a fermenter. Pellets can be induced into fermenting, finished, or crashed beer, and the pellets are reduced to the proper size allowing the hops to settle during the holding period allowing for maximum exposure, aroma, and flavor. Ampco's Cellar Carts are lightweight and robust 2 wheeled carts designed to provide users with maximum mobility. Their corrosion-resistant stainless steel frames, solid polypropylene wheels, and NEMA 4X VFD are just a few of the features of Ampco’s cellar carts. Each versatile cart is built to customer specifications and can include any of Ampco's centrifugal pumps, positive displacement pumps, or blenders. Carts are ergonomically designed for ease of use in tight spaces. Ampco’s Wine and Must Carts come equipped with ZP1 Series positive displacement pumps. Wine carts are available in 4 standard model sizes. All carts also feature 304 stainless steel construction, 10" foam-filled tires, and NEMA 4X VFD. Other options are available for each model.